Just add water! 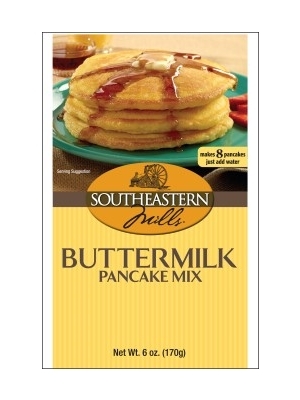 Southeastern Mills Buttermilk Pancake Mix is light and fluffy restaurant quality pancakes. Makes 6 pancakes. Preheat oven to 375 degrees. Combine pancake mix with water. Mix until smooth. Poor batter onto the lightly greased hot griddle. Turn when bubbles form on top of pancakes. Cook until golden brown on each side. Bleached enriched wheat flour (wheat flour, niacin, reduced iron, thiamine mononitrate, riboflavin, folic acid), yellow corn flour, shortening (partially hydrogenated soybean oil, lactose, dried buttermilk, mono and diglycerides, dried whey, sodium ailicoaluminate, sugar, artificial flavor), dextrose, sugar, leavening (sodium bicarbonate, sodium aluminum phosphate, monocalcium phosphate), salt, dried egg yolks. Allergy Information: This product contains egg, milk and wheat. The best - better than Perkins or anywhere else!